For me, there’s no such a thing as a season for soothing, warm dishes. I eat them all year round, whenever I feel like I need a big bowl of comfort to wash away the worries of the day/week. A good salad is great during the summer, but it won’t caress your body and make you feel like everything will be okay the way a beef stew will. 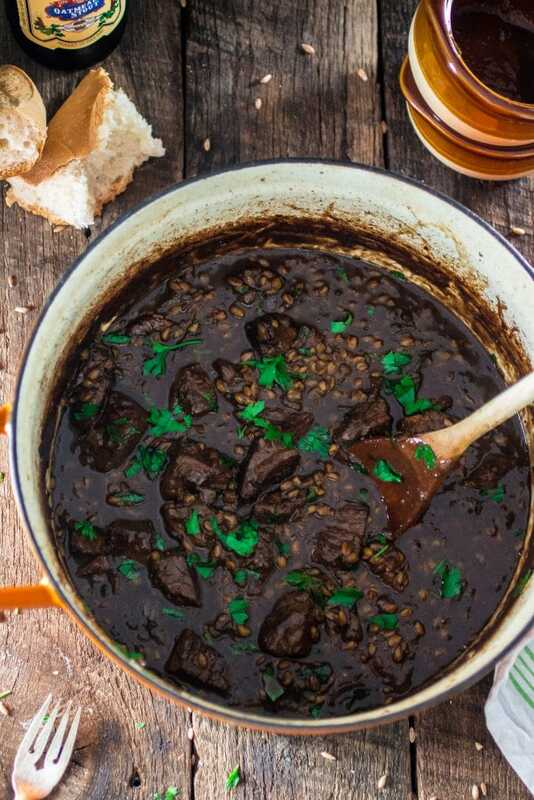 I received a copy of Simply Ancient Grains by Maria Speck to review and as I was browsing through the delicious recipes, I came across the recipe for Flemish Beef Stew with Caramelized Onions and Rye Berries. My heart fluttered, my mouth watered and I instantly knew that this was what I was going to make. 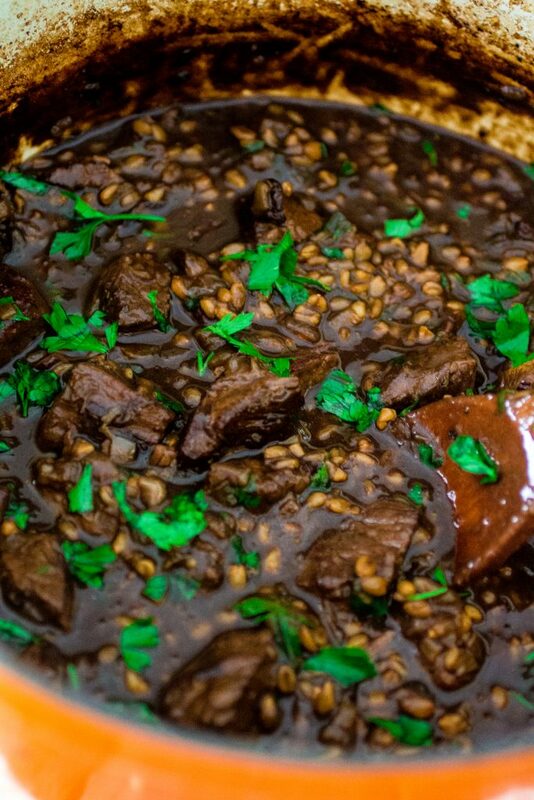 However, since I couldn’t find rye berries anywhere (Sometimes it’s hard to believe I live in one of the biggest cities of the world…), I adapted the recipe to Flemish Beef Stew with Caramelized Onions and Spelt Berries! I am so in love with this cookbook that, for the past two weeks, I’ve been carrying it with me everywhere I go. Whenever I have time, either during my break at work or when I’m at the subway, I open it and read a few recipes and look at the beautiful photography! Yes, it is worth it the extra weight in my bag and the extra stress on my back because at the end I’ll be making better food choices for me and my family. 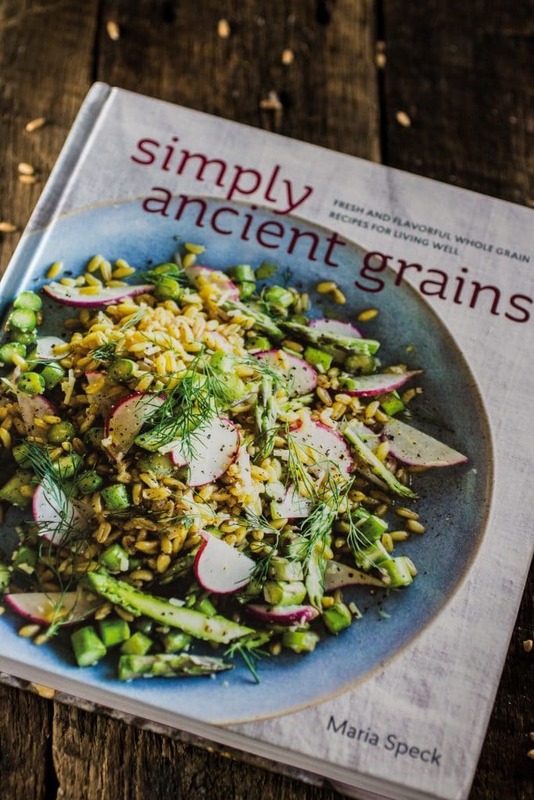 The book is full of fresh and flavorful whole grain recipes and Maria Speck makes it seem easy to add ancient grains to a busy lifestyle. She also has an Ancient Grains 101 chapter which is an overview of all the grains and flours that she uses in the book. It is great information to have as she teaches us a little bit about the texture, flavors and nutrition from these grains along with some history. Did you know that the early humans (the so called hunter-gatherers) started cultivating grains around 10.000 years ago to help them through cold, hard winters. Unlike fresh fruit, meat and leaves, grains could be collected and stored to be consumed later – aiding humans to survive. Also, they were (still are!) extremely versatile and could be turned into many different and delicious things, like bread, pasta, stews and even drinks! Also valuable is the chapter on how to cook, rinse, soak, toast, bake, freeze, store, keep and shop grains. If you want to start incorporating more of these great grains to your eating habits, this book is an absolute must-have! Can you tell my adoration for this cookbook? I’m determined to make every single of these recipes as one sounds more delicious than the other. 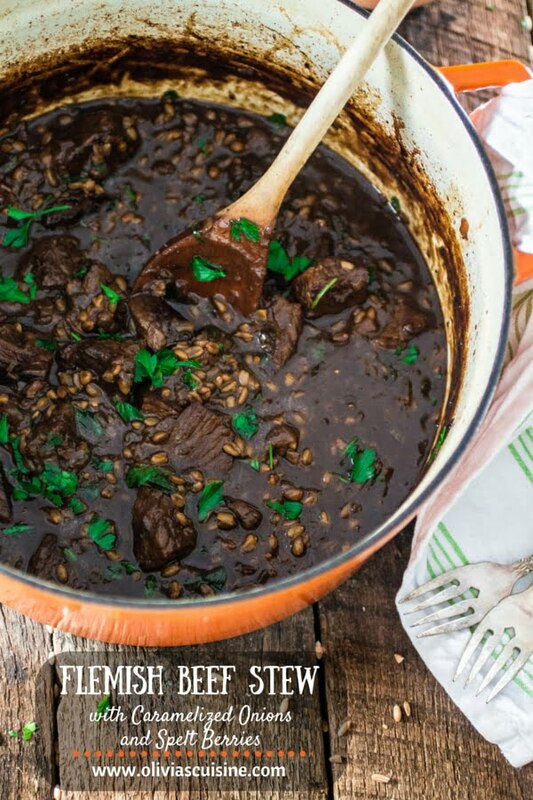 This stew recipe got the husband’s seal of approval, but to be honest, most meat recipes do. We ate it twice this week. I made it for the first on Monday but I ended up hating the pictures I took, so it didn’t make the blog. So later in the week, I made it again and it was great cause I got to slightly twitch a thing or two and customize it to my taste! Tim, of course, didn’t complain and devoured two big bowls of stew hot out of the oven. According to Maria Speck, this stew is even better if you make it up to 2 days ahead and then gently reheat over medium high heat. But in my household that’s impossible! Anything meaty disappears in a matter of seconds because of my T-Rex husband. Especially when there is beer involved. We had the same beer I cooked with with our meal. However, this dish can totally be accompanied by a glass of bold red wine, like a Malbec or a Merlot! And while this dish is a little time consuming, most of the work is done in the oven and you won’t need any side dishes! Ok, maybe some crusty bread to soak all that rich and delicious dark broth. Nothing else! Start by soaking your spelt berries in cold water, overnight. The next day, start by cooking your spelt with 3 cups of water and a bay leaf. Bring to a boil, over medium high heat and, once it boils, lower the heat, cover and let it simmer for 60 minutes or until the spelt is tender with a slight chew. Reserve. While the spelt cooks, preheat your oven to 325F degrees. Pat dry the beef with a paper towel and season with salt and pepper. Heat the olive oil in a large dutch oven, over medium-high heat, and working in batches, brown the meat on all sides. Remove from pot and reserve. Lower the heat to medium, and if necessary, add some more olive oil to the pot. Add the onions, season with salt and pepper and cook the onions until soft, about 10 minutes, stirring frequently and scraping the bottom to release any browned bits. Once onions are soft, add the brown sugar and cook until the onions smell sweet and look caramelized, 3 to 5 minutes. Sprinkle the flour, stir well and cook for about a minute to cook off the raw flour taste. Add the beer, the reserved beef with its juices, the beef broth, the balsamic vinegar and the herbs. Increase heat to medium-high, bring the stew to a boil, cover and transfer to the oven. Cook for 1 1/2 hours and then add the spelt with any remaining cooking liquid. 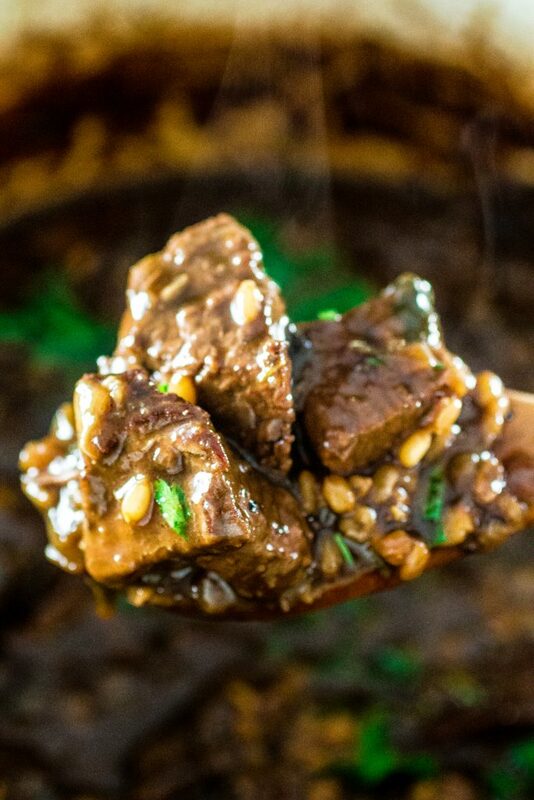 Bring the dutch oven to the oven again and keep cooking for 1/2 hour more, or until the beef is fork-tender. To finish, discard the bay leaves and the herb twigs. Garnish with the chopped parsley and serve. You can make this stew up to 2 days in advance. Allow it to cool to room temperature and refrigerate in an airtight container. Gently reheat over medium heat, stirring occasionally. You can also freeze it for up to a month! « Cream Just Got Real! – Introducing Brooklyn Creamery’s Single and Double Cream. Wonderful recipe for our “hard” Autumn!!! I am absolutely 100% with you on enjoying warm and comforting dishes all year round. Even when it’s 110 degrees outside, I will still get a craving for something a little heartier. This beef stew totally fits that bill! 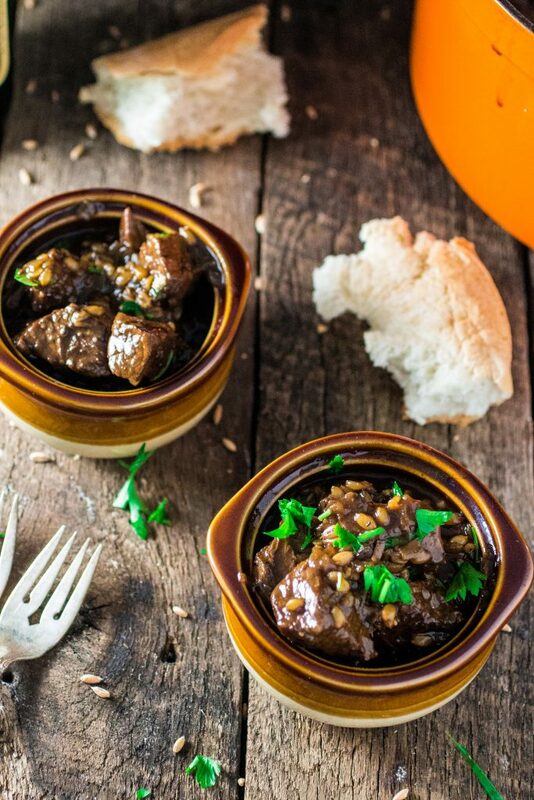 The flavors sound wonderful and that stew meat looks SOOO tender and unbelievably delicious! I swear I heard your photographs calling my name and saying “eat meeeee”… especially the extreme close up shot (drool!!!!!) If you want to make this stew again, for a third time, feel free to send some my way! :) Cheers, pretty lady! 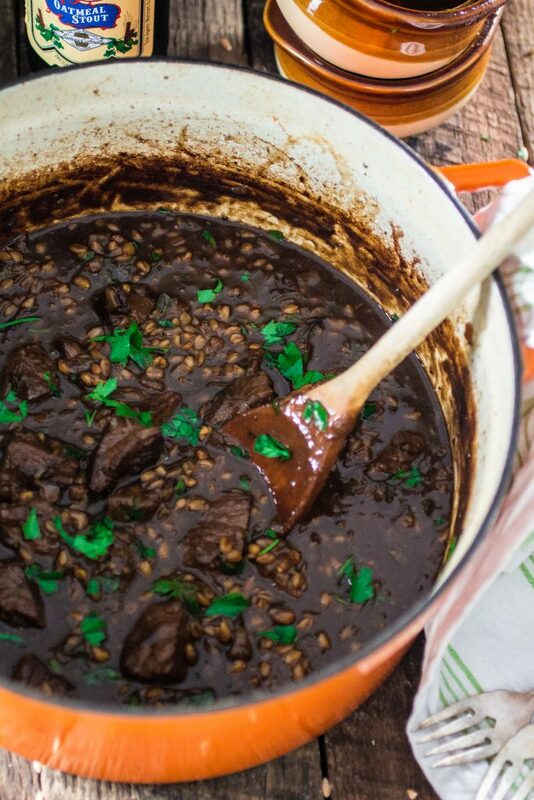 This stew looks so rich and comforting! OMG how I would love to just grab a spoon and eat this right now, the beef looks so tender and delicious. I am such a fan of beef stew that I am ok to turn my house into an oven even during summer. Is there a reason you chose red onion for this recipe instead of white or yellow? Many thanks! I look forward to making this.